I can be a bit scattered at times. I also have some commitment issues. As much as I love this blog, I keep getting ideas for other “formats” for a cooking or baking blog. I can’t tell you how many times I’ve either started, or considered starting, other blogging projects, all revolving around food. And then I usually just ask myself, why not just consolidate? Why do you need 99 blogs? So are you wondering what on earth I’m talking about yet? Well, here goes. Most of the time, I just cook for myself. So when I roast a whole chicken, that results in a lot of leftovers that I have to figure out what to do with. Some of the leftover chicken gets earmarked for salads for lunches, but there’s still a lot of meat left. Especially when you accidentally buy a five pound chicken from the butcher, and you usually go for a three pound chicken. So with this series of posts, I’m going to show you what I did with the leftovers. I used every piece of that chicken, including the carcass. I like to get my money’s worth. 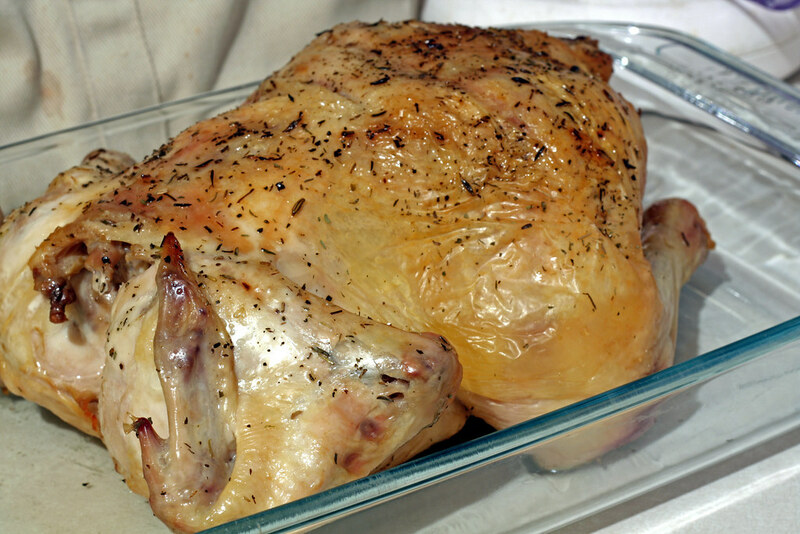 Two days ahead: salt the inside and outside of the chicken and place in a pyrex dish. Cover with plastic wrap and refrigerate. The day of: take the chicken out of the refrigerator one hour before starting prep work, to bring the bird closer to room temperature (this ensures even cooking). 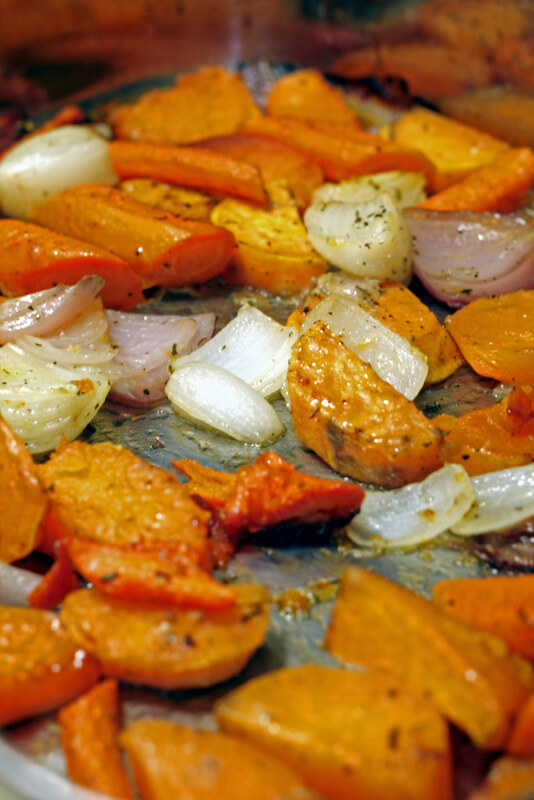 Preheat the oven to 425*F.
Peel and slice the sweet potatoes into 1/2 inch pieces. Cut the very large slices in half. Peel and cut the carrots into 2 inch pieces. Peel the onions, cut in half, and then cut each half into fourths. 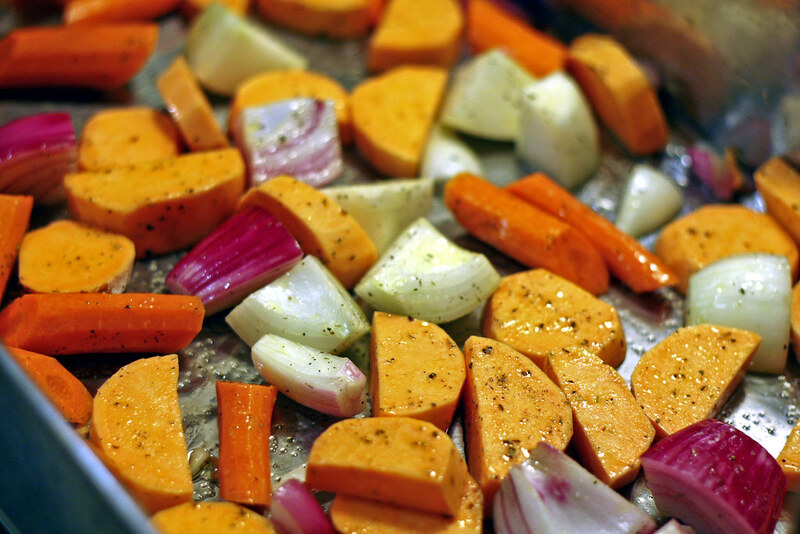 Place all vegetables in a roasting pan and drizzle with the olive oil. Sprinkle with salt and herbs de provence, and give them all a toss with your hands to distribute the oil and seasonings. Position the rack about the vegetables. Place the chicken breast-side up on the rack. Roast for 20 minutes, then flip the chicken over, with the breast-side down. 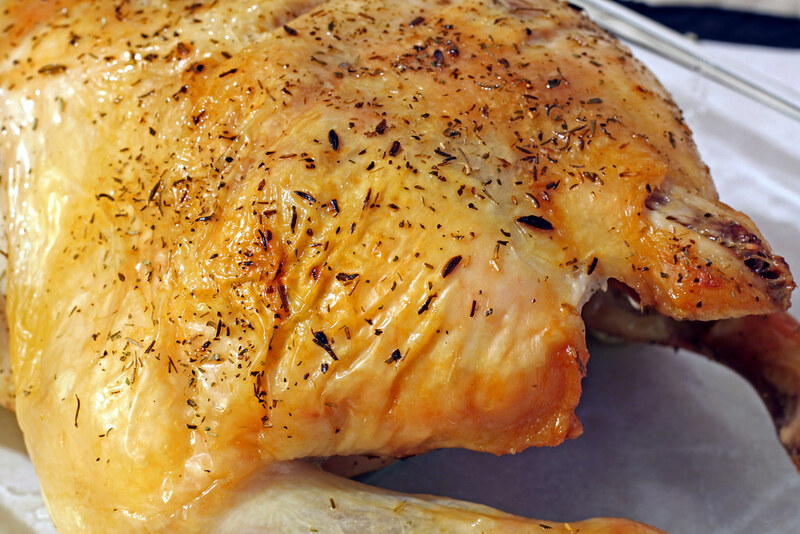 Roast for 30 minutes and flip the chicken back to being breast-side up. Roast until the chicken is cooked through (thermometer registers 175*F when inserted in the thigh) – this took about seven more minutes. 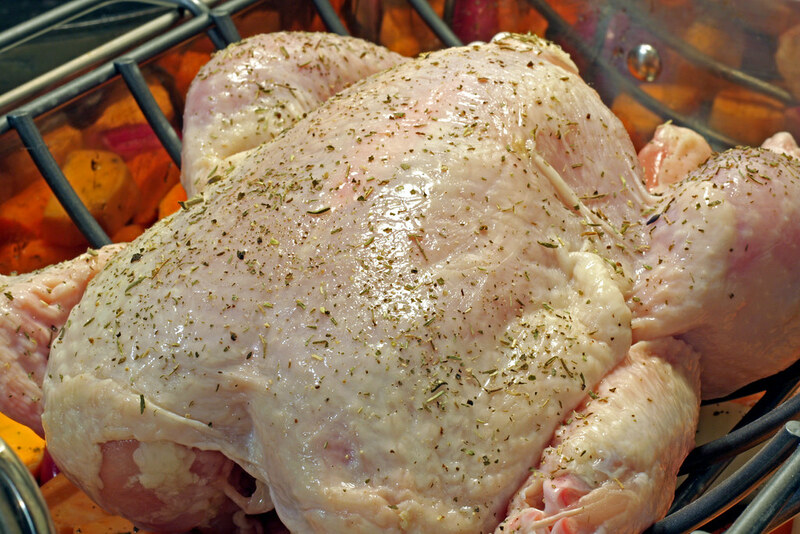 Remove chicken from rack to a platter, breast-side down (this allows juices to “run down” into the breast, resulting in moist meat), for 10-15 minutes. Stir the vegetables and return to the oven for 10 minutes to crisp them up. Carve the chicken and serve with the vegetables. After dinner, I shredded the remaining chicken and divided the breast meat and thigh/leg meat – each got their own container. Stay tuned to see what happens to the leftovers! Whatever you do, do NOT skip the step of salting the chicken ahead of time. This lends flavor to the bird, as well as keeps it moist. Save the carcass for chicken stock! If you can’t make it that night, throw the carcass in a plastic bag and freeze it. Continue adding chicken bones to the bag until you have a day where you can make stock. Beautiful…looking forward to the related posts to see how the rest of it ‘goes’. Your pics are wonderful, flash or no flash! Mmm, nothing beats a good roasted chicken. I loved Sundays because that is when my mom would make one. Yours looks tasty. Deeba – thank you so much for the compliment. Peabody – I also have fond memories of my mom’s roast chicken. We didn’t have it every week, but when we did, it was like a mini-Thanksgiving celebration.